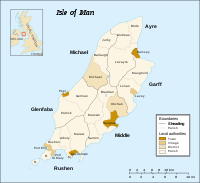 The Isle of Man ( Manx: Ellan Vannin [ˈɛlʲən ˈvanɪn]), sometimes referred to simply as Mann ( /mæn/; Manx: Mannin [ˈmanɪn]), is a self-governing British Crown dependency in the Irish Sea between Great Britain and Ireland. The head of state is Queen Elizabeth II, who holds the title of Lord of Mann and is represented by a lieutenant governor. Defence is the responsibility of the United Kingdom. The name is probably cognate with the Welsh name of the island of Anglesey, Ynys Môn,  usually derived from a Celtic word for 'mountain' (reflected in Welsh mynydd, Breton menez, and Scottish Gaelic monadh),   from a Proto-Celtic *moniyos. The Isle of Man is located in the middle of the northern Irish Sea, almost equidistant from England, Northern Ireland, Scotland (closest), and Wales (farthest). It is 52 kilometres (32 mi) long and, at its widest point, 22 kilometres (14 mi) wide. It has an area of around 572 square kilometres (221 sq mi). Besides the island of Mann itself, the political unit of the Isle of Man includes some nearby small islands: the seasonally inhabited Calf of Man,  Chicken Rock on which stands an unmanned lighthouse, St Patrick's Isle and St Michael's Isle. The last two of these are connected to the main island by permanent roads/causeways. At the 2016 census,  the Isle of Man was home to 83,314 people, of whom 26,997 resided in the island's capital, Douglas and 9,128 in the adjoining village of Onchan. The population decreased by 1.4% between the 2011 and 2016 censuses. By country of birth, those born in the Isle of Man were the largest group (49.8%), while those born in the United Kingdom were the next largest group at 40% (33.9% in England, 3% in Scotland, 2% in Northern Ireland and 1.1% in Wales), 1.8% in the Republic of Ireland and 0.75% in the Channel Islands. The remaining 8.5% were born elsewhere in the world, with 5% coming from EU countries (other than the UK and Ireland). The Isle of Man Full Census, last held in 2016,  has been a decennial occurrence since 1821, with interim censuses being introduced from 1966. It is separate from, but similar to, the Census in the United Kingdom. The Isle of Man has a temperate oceanic climate ( Köppen Cfb). Average rainfall is higher than averaged over the territory of the British Isles, because the Isle of Man is far enough from Ireland for the prevailing south-westerly winds to accumulate moisture. Average rainfall is highest at Snaefell, where it is around 1,900 millimetres (75 in) a year. At lower levels it can be around 800 millimetres (31 in) a year. The highest recorded temperature was 28.9 °C (84.0 °F) at Ronaldsway on 12 July 1983. The island's parliament, Tynwald, is claimed to have been in continuous existence since 979 or earlier, purportedly making it the oldest continuously governing body in the world, though evidence supports a much later date. Tynwald is a bicameral or tricameral legislature, comprising the House of Keys (directly elected by universal suffrage with a voting age of 16 years) and the Legislative Council (consisting of indirectly elected and ex-officio members). These two bodies also meet together in joint session as Tynwald Court. 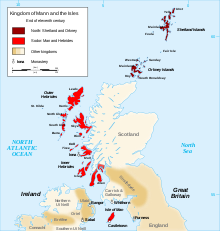 In various laws of the United Kingdom, "the United Kingdom" is defined to exclude the Isle of Man. Historically, the UK has taken care of its external and defence affairs, and retains paramount power to legislate for the Island. 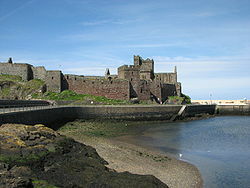 However, in 2007, the Isle of Man and the UK signed an agreement  that established frameworks for the development of the international identity of the Isle of Man. There is no separate Manx citizenship. Citizenship is covered by UK law, and Manx people are classed as British citizens. The Isle of Man holds neither membership nor associate membership of the European Union, and lies outside the European Economic Area (EEA).There is a long history of relations and cultural exchange between the Isle of Man and Ireland. The Isle of Man's historic Manx Gaelic language (and its modern revived variant) are closely related to both Scottish Gaelic and the Irish language, and in 1947, Irish Taoiseach Éamon de Valera spearheaded efforts to save the dying Manx language. All of these services are controlled directly by the Department of Home Affairs of the Isle of Man Government, and are independent of the United Kingdom. Nonetheless, the Isle of Man Constabulary voluntarily submits to inspection by the British inspectorate of police,  and the Isle of Man Coastguard contracts Her Majesty's Coastguard (UK) for air-sea rescue operations. The Isle of Man is neither part of the European Union, nor has a special status, and thus did not take part in the 2016 referendum on the UK's EU membership. However, Protocol 3 of the UK's Act of Accession to the Treaty of Rome included the Isle of Man within the EU's customs area, allowing for trade in Manx goods without tariffs throughout the EU. As it is not part of the EU's internal market, there are still limitations on the movement of capital, services and labour. The Isle of Man Department for Enterprise manages the diversified economy in 12 key sectors. The largest sectors by GNP are insurance and eGaming with 17% of GNP each, followed by ICT and banking with 9% each. The 2016 census lists 41,636 total employed. The largest sectors by employment are "medical and health", "financial and business services", construction, retail and public administration. Manufacturing, focused on aerospace and the food and drink industry,  employs almost 2000 workers and contributes with about 5% of gross domestic product (GDP). The sector provides laser optics, industrial diamonds, electronics, plastics and aerospace precision engineering. Tourism, agriculture, fishing, once the mainstays of the economy, now make very little contributions to the island's GDP. The Isle of Man is a low-tax economy with no capital gains tax, wealth tax, stamp duty, or inheritance tax  and a top rate of income tax of 20%. A tax cap is in force: the maximum amount of tax payable by an individual is £125,000 or £250,000 for couples if they choose to have their incomes jointly assessed. Personal income is assessed and taxed on a total worldwide income basis rather than a remittance basis. This means that all income earned throughout the world is assessable for Manx tax rather than only income earned in or brought into the island. The Isle of Man Government Lottery operated from 1986 to 1997. Since 2 December 1999 the island has participated in the United Kingdom National Lottery. The island is the only jurisdiction outside the United Kingdom where it is possible to play the UK National Lottery. Since 2010 it has also been possible for projects in the Isle of Man to receive national lottery Good Causes Funding. The good causes funding is distributed by the Manx Lottery Trust. Tynwald receives the 12p lottery duty for tickets sold in the island. The music of the Isle of Man reflects Celtic, Norse and other influences, including from its neighbours, Scotland, Ireland, England and Wales. A wide range of music is performed on the island, such as rock, blues, jazz and pop. However, its traditional folk music has undergone a revival since the 1970s, starting with a music festival called Yn Çhruinnaght in Ramsey. This was part of a general revival of the Manx language and culture after the death of the last native speaker of Manx in 1974. 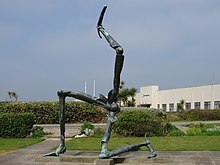 The Isle of Man was mentioned in the Who song " Happy Jack" as the homeland of the song's titular character, who is always in a state of ecstasy, no matter what happens to him. 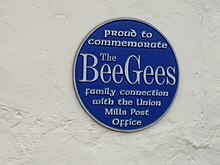 It is also the birthplace of Maurice, Robin and Barry Gibb, of the Bee Gees. Seafood has traditionally accounted for a large proportion of the local diet. Although commercial fishing has declined in recent years, local delicacies include Manx kippers (smoked herring) which are produced by the smokeries in Peel on the west coast of the island, albeit mainly from North Sea herring these days. The smokeries also produce other specialities including smoked salmon and bacon. Crab, lobster and scallops are commercially fished, and the queen scallop (queenies) is regarded as a particular delicacy, with a light, sweet flavour. Cod, ling and mackerel are often angled for the table, and freshwater trout and salmon can be taken from the local rivers and lakes, supported by the government fish hatchery at Cornaa on the east coast. Cattle, sheep, pigs and poultry are all commercially farmed; Manx lamb from the hill farms is a popular dish. The Loaghtan, the indigenous breed of Manx sheep, has a rich, dark meat that has found favour with chefs,   featuring in dishes on the BBC's MasterChef series. The Manx Grand Prix is a separate motorcycle event for amateurs and private entrants that uses the same 60.70 km (37.72 mi)  Snaefell Mountain Course in late August and early September. Prior to the introduction of football in the 19th century,[ citation needed] Cammag was the island's traditional sport. It is similar to the Irish hurling and the Scottish game of shinty. Nowadays there is an annual match at St John's. 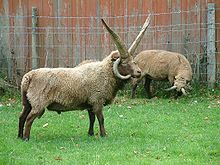 The Manx Loaghtan sheep is a breed native to the island. It has dark brown wool and four, or sometimes six, horns. The meat is considered to be a delicacy. There are several flocks on the island and others have been started in England and Jersey. ^ Wilson, RJA (2000). "On the Trail of the Triskeles: From the McDonald Institute to Archaic Greek Sicily". Cambridge Archaeological Journal. 10 (1): 35–61. doi: 10.1017/S0959774300000020. Russel, G. (1988). "Distribution and development of some Manx epiphyte populations". Helgolander Meeresunters. 42 (42): 477–492. Bibcode: 1988HM.....42..477R. doi: 10.1007/BF02365622.